Dizzy Gillespie is a major player in jazz history. He helped found Be-Bop. His big band produced the first successful fusion of Afro-Cuban rhythms and jazz. He was perhaps the greatest virtuoso on jazz trumpet. Dizzy Gillespie was born John Birks Gillespie on October 21, 1917 in Cheraw, South Carolina. He was the youngest child of nine children and his father was a bricklayer, musician and band leader. The elder Birks encouraged all of his children to learn to play music and the instruments for his bands were kept in the home. However, his first eight children did not show any great talent for music. His youngest child eventually made up for the older eight in musical talent. When young Dizzy tried to learn to play trombone, his arms were too short to reach all of the slide positions. So, he taught himself trumpet instead. In 1930, when he was learning to play trumpet, Gillespie heard The Teddy Hill Orchestra broadcasting live from the Savoy Ballroom in New York. He fell in love with the band and especially with the playing of trumpeter, Roy Eldridge. 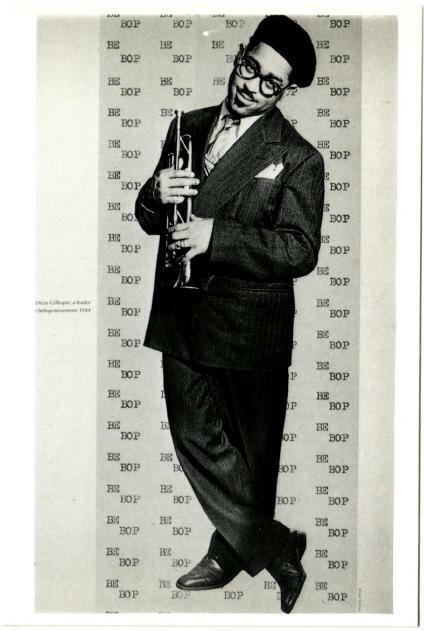 Young Dizzy Gillespie decided he wanted to be a jazz trumpet player like his idol, Roy Eldridge. After graduating from his local school in 1933, Gillespie was awarded a scholarship to a tiny black prep school - Laurinburg Institute in North Carolina. He attended Laurinburg and played music there for two years until his family moved to Philadelphia in 1935. Dizzy left school and moved to Philadelphia getting his first fulltime musician's job with Frankie Fairfax's band in Philadelphia. While gigging in Philadelphia he learned all of his idol Roy Eldridge's solos from records and broadcasts. In 1937 Dizzy Gillespie moved to New York and took Roy Eldridge's place in the Teddy Hill Orchestra. His first recording was made that year with Hill : "King Porter Stomp". He also met a chorus girl from the Apollo Theatre named Lorraine whom he married in 1940 and with whom he stayed married until his death in 1993. Gillespie left Teddy Hill's band after about a year and free-lanced for a year. Cuban trumpet player, Mario Bauza, then helped Dizzy join Cab Calloway's big band in 1939. He stayed in this popular band until 1941 and one can hear the development of his playing in the short solos he took in his recordings with Calloway. Cab Calloway did not like his style of playing nor his love of humor and practical jokes. In a famous incident in 1941, Calloway was hit in the back of the head by a spitball thrown by another musician and blamed Gillespie for throwing it. They argued strongly about it and that argument ended with with Cab receiving a knife cut that require stitches and with Dizzy being fired. During his tenure with Calloway, he began writing big-band arrangements for Woody Herman, Jimmy Dorsey and others. He became friends with alto saxophonist, Charlie "Bird" Parker . He began sitting in at Minton's Playhouse and Monroe's in Harlem with emerging bebop stars Bird, pianist Thelonius Monk, drummer Kenney Clarke, Guitarist Charlie Christian, and with swing stars Roy Eldridge , Coleman Hawkins , Lester Young , Benny Goodman, Ben Webster and others. Dizzy Gillespie was not highly regarded by most established trumpet stars at this time. The established swing trumpet players focused on good tone and intonation. He was focusing on harmonic evolution and had a rather thin tone. His tone got better later on. From 1941 to 1943 Gillespie played in several big bands, including Benny Carter, Lucky Millander, Charlie Barnet and Earl Hines. Gillespie and Bird Parker were together in the Earl Hines big band and also in the Billy Eckstine big band of 1944. In 1945 Dizzy left the collapsing Billy Eckstine big band to return to small combo playing. From the early jam sessions at Minton's Playhouse as the 1930s were closing until 1944 a new form of jazz was being developed by Gillespie, Parker, Monk and others. A small combo would consist of typically five musicians - trumpet, sax, piano, bass and drums. New melodies were superimposed over the chord structures of classic jazz songs. The trumpet and sax would begin a number by playing in unison at breakneck speed. Melodies and improvisations were often harmonically based on the upper intervals of the chord changes. Dizzy and Bird were playing 9ths, 11ths, 13ths and creating a new kind of jazz harmony and rhythm. It was called be-bop. In 1944 the first acknowledged be-bop recording featured Coleman Hawkins and Gillespie. In May, 1945 Gillespie led a combo with Chalie Parker (alto sax), Al Haig (piano), Curly Russell (bass) and Sid Catlett (drums). This All Star Combo recorded highly influential bebop tracks including "Shaw 'Nuff", "Salt Peanuts" and "HotHouse". The history and development of jazz is organic and evolutionary. However a ban on recording in the early 1940s, instigated by the Musician's Union, prevented most other musicians and the public from hearing the development of bebop from swing. The 1945 recordings seemed revolutionary and bebop was decried by many leading musicians and critics and it received a mixed reaction from audiences. No longer dance music, jazz became a more intellectual music for listeners. Mario Bauza got Gillespie into Cab Calloway's big band and showed Gillespie how to really blow his horn. He also sparked a growing interest in Afro-Cuban rhythms by Dizzy. In 1946 he re-formed a big band and added Cuban percussionist Chano Pozo. Gillespie created the first successful synthesis of jazz and Afro-Cuban music. "Manteca" and "Cuban Be - Cubana Bop" are two of the best known recordings of this start of Latin jazz. In the 1940s Dizzy Gillespie created a new standard in trumpet virtuosity with his range and dramatic command of the instrument and his suppleness of rhythm, unevenly spaced phrases and complex, chromatically augmented runs played at breathtaking speed. Many consider him the greatest trumpeter of them all. He and others also established bebop as a style of jazz for both small combos and big bands. He taught and influenced many other musicians including trumpeters Miles Davis, Fats Navarro , Clifford Brown , Lee Morgan and John Faddis. After his tremendous creative output of the 1940s, Dizzy Gillespie continued to play and lead at an extremely high level. He played mostly in small combos but sometimes resurrected a big band and performed until shortly before his death in 1992. Like Louis Armstrong before him, Dizzy Gillespie influenced players on all instruments. Like Armstrong he created a new trumpet style. Armstrong largely created swing which became the musical language of small groups and big bands. Gillespie and others created bebop which became the next language of small groups and big bands. All of jazz is richer because of John Birks Gillespie.